Does a social media presence help Google rankings? I read a great blog post recently explaining that as a business, and whether you like it or not, your website is NOT the same as your Internet presence. To see the truth of this, just google any major brand and see what proportion of those links are to the company’s main website. Depending on the brand, their own site may not even make the top spot. But even if it does, below that will be a big cluster of other “stuff” which customers, and potential customers, will read – and all of which can potentially impact on the perception of that company. Some of that “stuff” will be the company being represented on websites that they can control – they can choose to claim their own presence there and add to it. Google Places is one example of this. Others are less controllable – a hotel might have a strong representation on Trip Advisor for all the wrong reasons, for example. Most of the sites that show up, though, will be social in some form or another, and usually any company can choose to actively develop a profile. If a business has an active Blog or Facebook page, these will show up early on in the Google rankings. Can your customers find you online at all? There are many, many subtleties and complications around the art of SEO which we absolutely don’t plan to cover here. Suffice to say that high rankings don’t always equal traffic, and traffic doesn’t always equal customers – and customers are why we’re all here, right? But, you should at least be highly visible when a potential customer googles your company name. If you’re not, there may be major issues with your online presence, which tend to lead to major issues with credibility. Our website is, as it should be, the top result; and Google likes it enough right now to provide some featured sub-listings (called “sitelinks”) into parts of our site it thinks are important, including our Blog. Which is nice. Below that, though, you can see the impact of our activity on social media: our Facebook and LinkedIn profiles are both on the first page, along with other smaller forums such as 4networking and bestofbury, on which we feature. Twitter, interestingly, doesn’t show up at all – primarily because neither the main username nor the description fields are long enough to accept “Rose McGrory Social Media”. 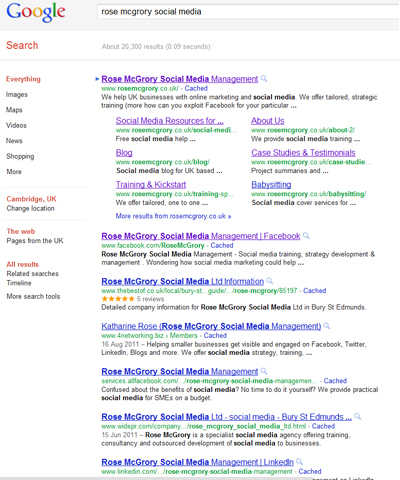 Both Twitter and our YouTube channel do make page one if the search is limited to “rosemcgrory”. Our social media profiles help us to own that crucial first page of Google when anyone searches for our company name, but they will also boost rankings by driving traffic directly to our website – and Google likes a busy website. So social media and website rankings are mutually supportive, provided you do a good enough job of your social media postings to either send traffic directly to your site, or at least induce some curiosity as to what you’re about. From our analytics, we know that many of you reading this article will be here because they saw a Tweet about this post – and without that activity, you probably wouldn’t have gotten around to visiting, right?! Another great blog post from the ladies in the know. If websites are your shop window to the world, social media is the concierge who opens door and invites that world outside your window to come on in and join the party. There’s a whole other blog post in there – “is your social media concierge Mel Gibson or an ill mannered lout” ! !